Reeds House #10 is a very private beachfront condo offering every desired amenity. With 2 king bedrooms (both with en-suite bathrooms), Reeds House #10 is ideal for 1 or 2 couples. The condo is located right on the beach, so guests only have to walk a few steps to the water’s edge where they can swim or lounge in the sun. 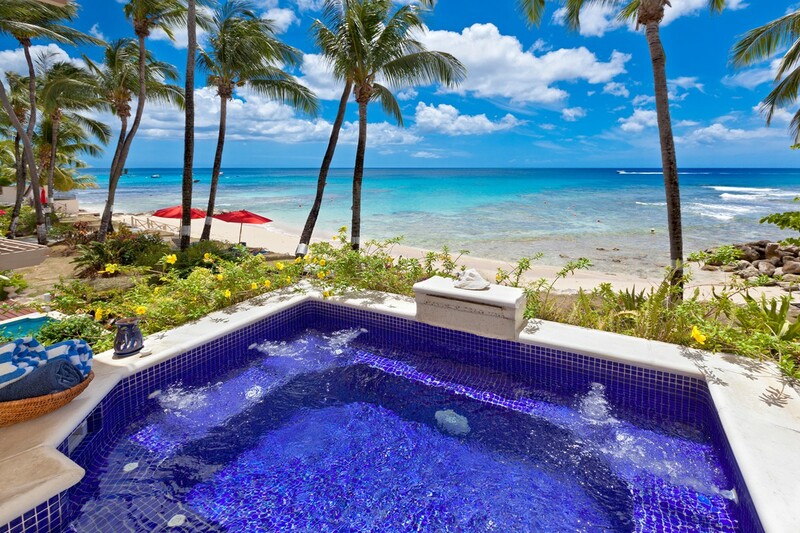 A private plunge pool is also on the premises - perfect for day or night swims. Inside you will find a well equipped kitchen, a spacious living area, and comfortable bedrooms, all of which are air conditioned for your comfort. Best of all, the condo offers its guests a cook/housekeeper/laundress who will prepare meals and insure that you have a great stay! Reeds House #10 is a two-bedroom condominium overlooking the Caribbean Sea. The unit is located on the first floor, at the northern end of the building. A plunge pool adds to the comfort of the covered patio with its sitting area, dining terrace, and wet bar. Both bedrooms are air-conditioned with en-suite bathrooms. The master bedroom has a walk-in closet and safe, and opens out to its own private terrace. Bedroom number 2 opens out to the dining terrace. The unit consists of two LCD (Liquid Crystal Display) TVs with a library of DVDs (26 movies). 2 meals a day. Guests choice of breakfast and lunch, or lunch and dinner. Welcome by special arrangement only. My wife and I wanted to take my in-laws away for a nice vacation in a tropical setting. Reed’s 10 fit the bill and the staff was unbelievable. Gillian took great care of us and cooked some great Bajan meals. The chicken curry was our favorite. Lisa and Mark were great in helping us figure out how to get around and which restaurants we should visit. The condo had everything we needed and the 24 hour breeze was fantastic. Only negative I’d bring up is the road noise. The condo sits on a busy street and unless you were out on the deck listening to the crashing of waves, the noise from the traffic was distracting. All in all, we had a wonderful time and would recommend. Andrew at WhereToStay.com did a great job getting us all setup and explaining how things worked. Andrew is also very responsive.